If we were to count up how many times in our life we have heard the Nativity Story, it would probably amaze us! It's a wonderful story, but so many times, as it is with other familiar stories, we tend to lose our awe of it and the amazement of God's love. Following is an interactive Christmas Bible lesson for really any age group that hopefully will bring us back to a place of amazement as if hearing it for the very first time! This may be used for a Sunday school or church group or maybe even as a Christmas tradition for your family. It's easy to adapt for any age by adjusting the conversation to the age level of your audience. For children there are also Nativity Story ideas that can be added to capture their attention, as well as their little hands! There are many other Christmas activities available too. Place the Nativity pieces and Scriptures randomly in front of the the group. Begin the lesson by picking up the puzzle piece with John 1:1-5 and the baby Jesus figure. 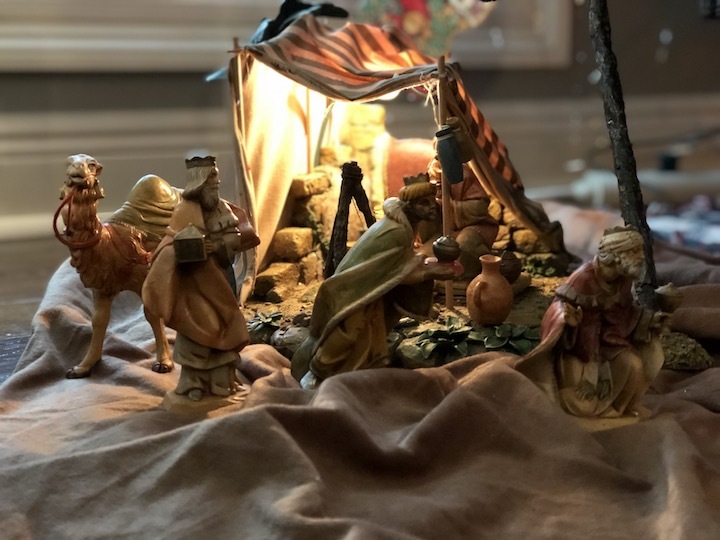 Explain that although most of us have heard the Christmas story of Jesus numerous times in our lives, we may not realize where the pieces come from and how they fit together. God used over 40 different men to write the 66 books of the Bible. Even when it came to recording the Nativity story, He chose to use three different men. Three of the four Gospels share various parts of the story. All three point to the fact that it's just the beginning chapter of the greatest story ever to be told! For each piece of the story take time for the group to think of what it must have been like for each character, to think of how their life can identify, and to give thanks to God for His story. Optional script - "The Promise - Genesis thru Revelation"
Point out that the Nativity story did not begin at the birth or even the announcement, it began with The Plan - John 1:1-5; it began with Jesus! "In the beginning the Word already existed. The Word was with God, and the Word was God. He existed in the beginning with God. God created everything through him, and nothing was created except through him. The Word gave life to everything that was created, and his life brought light to everyone. The light shines in the darkness, and the darkness can never extinguish it." Wonder: Place the baby Jesus at the center for the Nativity scene. Have you ever wondered what it must have been like for Jesus to leave Heaven and be born as a tiny, helpless baby dependent upon mere humans for His care? Have someone else read Matthew 1:18-25 and have them add Mary & Joseph to the Nativity scene. Wonder: Take time to talk about how young Mary must have been and the unknown she and Joseph would face. Both Mary and Joseph had to deal with what others were going to think about them. How do you think their family and friends received the news? Next have someone read Luke 2:1-20 adding the shepherds and the angel(s). 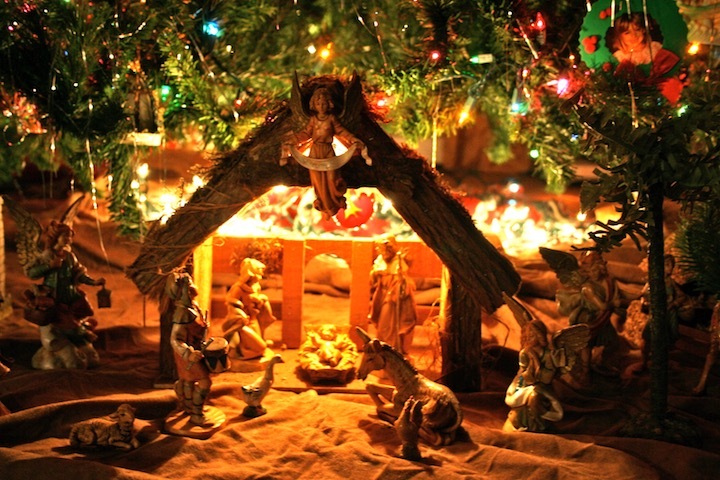 Wonder: Have you ever wondered why God did not prepare room in the Inn for Jesus to be born? He didn't forget! If Jesus had been born in an Inn or even someone's home, it's doubtful the shepherds would have been welcome to come in and see Him. Their job was a dirty one. They stank. They were looked down upon. Not by God though; He chose the lowly to give the invitation to His Son's birth! Have Matthew 2:1-12 read adding the wisemen. Make note that the wisemen actually came later when Jesus was probably a toddler - they entered a house and He is called a child. This event most likely falls between the events of Luke 2:38 and Luke 2:39. God in His infinite plan arranged it! Remember Daniel and his friends, Shadrach, Meshach & Abednego, along with many other Jews who were taken to Babylon during Judah's captivity? God's Word went with them in their hearts and also likely in writings among the artifacts taken from the temple. Daniel, himself, prophesied about the coming Messiah when he lived there. Remember the young Jewish girl, Hadassah, who became Queen Esther of Persia? God used her influence "for such a time as this" (Esther 4:4) to the point that "many of the people of the land became Jews" (Esther 8:17) opening the door for God's Scripture there! Read Luke 2:21 & John 1:14-17 bringing the story full circle back to Jesus. Wonder: The Wonder that God's Son stepped down out of Heaven to become Immanuel, God with us; He took on flesh while still being God! He was the Son of God, fully God, and the Son of man, fully man. He came to live. He came to die for our sin. He came to rise again and will return! The Wonder of God's love for us. His love for you. The Nativity story is a story of hope; may the Wonder of it all never grow old! After all pieces are in place from three of the four Gospels, have participants think about each character and to whom they most identify in their lives. This can lead to a great discussion such as the shepherds being such common people and considered as outcasts to Mary and Joseph facing the unknown to the Wise Men on a journey. 1st) Others from the story of the complete life of Christ that were touched by His love. Give them a few moments and then open discussion for anyone to share a name and how their life was touched. 2nd) Others they know now living whose lives have been touched and allow for sharing and discussion. 3rd) Finally others that they know of who need the touch of God's love in their lives. Don't share these out loud, but allow time for prayer for each and how God can use them to share His love into their lives.